I thought I’d take this opportunity to express my opinions on a woman who is, to my total astonishment, still all over the news. 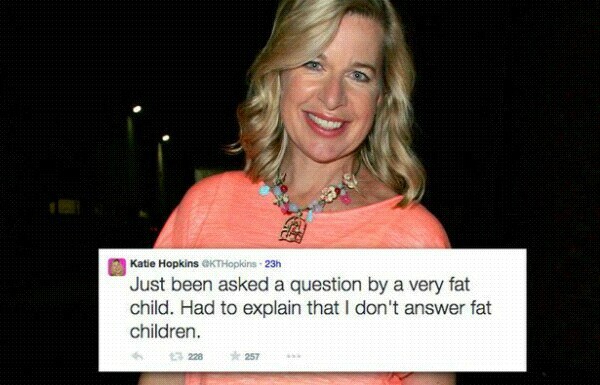 I quite enjoy the fact that I’m exactly the type of person that Katie Hopkins hates and quite frequently offends and discriminates against. I also enjoy that her opinions are so unbelievably bizarre to me as it only confirms the influences in my life and company I chose to keep is not at all associated with the negative and ignorant attitude she so frequently displays. Its inconceivable to me that one person can be so overwhelmed by such hateful bile that it can spew out without any notice so often. To me she is that woman that every child in the neighbourhood is scared of, the one that no child will knock on at Halloween and poisons people cats because it shat on her pristine back lawn once. The one who has poor miserable children that everyone feels sorry for because they aren’t allowed to associate with Tyler and Hannah playing on their bikes and enjoying a game of stuck in the mud because their schedules are full of ballet and fencing. The one with the miserable husband who was castrated the day he took his vows. I could go on but I’m sure you get the idea. As disgraceful as I think she is and everything she stands for for that matter, its impossible for me to take personal offence to anything she has said, even things that I can directly relate to my self. This is purely because I have no respect for the woman. How could I possibly be offended by someone I feel no compassion towards or anything at all actually. I do however feel for the people she does offend (which is probably into the millions now) because she seems to have a knack for picking on vulnerable people who don’t have a voice to reply to her accusations. By that I mean children, the working class poorer families who actually have an insight into the world she repeatedly attacks. People in war torn countries willing to risk their own and their children’s lives to migrate to somewhere safe to sleep, families who have seen and experienced things she can’t even comprehend. People suffering depression who struggle merely to function daily with an illness she can so callously dismiss, I do wonder if she’s ever been to a funeral of a child who has taken their own life to escape the popular mental illness and witnessed the horror of the parents grief. I already know the answer to my thoughts though, because its painfully obvious she speaks with total ignorance. She has obviously never experienced the majority of her outrageous assumptions because if she had she would have the knowledge to feel compassion. I’d like to finish with something I feel needs to be addressed. It makes me uncomfortable at how often Katie Hopkins uses the words free speech. I don’t want my children to be raised in a world where the things this woman says can be justified as freedom of speech. In my opinion it would be a travesty if comments and attitudes like these influenced the right they have to a voice and possibly influence how they use that right. 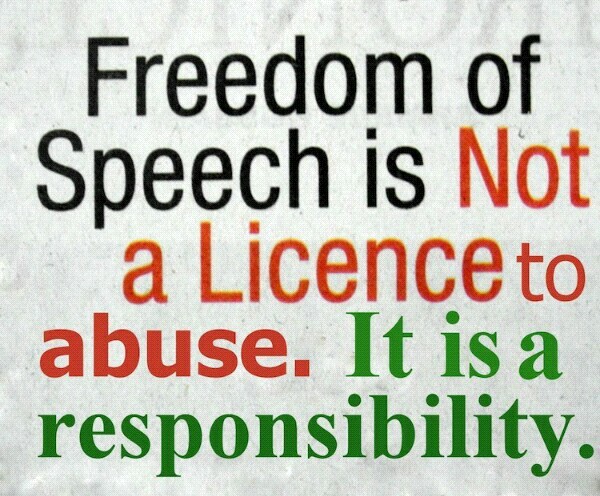 Others haven’t fought for generations to give people all over the world the right to freedom of speech for it be used simply to insult and offend. There is a huge difference in my opinion between voicing opinions in a manner that will be heard rather than saying things in a insulting way just to get your singular voice to be heard above others no matter who it hurts or offends. I feel it abuses and wastes that right that thankfully we all now have. I for one will always teach my children to articulate themselves in way that isn’t intentionally insulting no matter how strongly they feel and to never take for granted their right to a voice that so many still do not have. ← Going the full 12 rounds with Charlotte Crosby!